Show your customers what they want to see. Power*Search gets to know your customers browsing habits and displays search results according to what they have been clicking on. The “Most Popular” sorting option triggers the Intelligent Search. Fast Search Results Are Displayed to Minimize Search Abandonment. Deliver relevant search results to your customers at lightning fast speed. Exploring a huge inventory is a much different and more pleasant experience with fast, accurate search results. The system uses an incredibly powerful search algorithm that searches thousands to millions of products in a fraction of the second. Unlimited Search Filters Are Available to Customize Your Search Navigation. Let your customers easily drill down to the exact set of products they would like to view. Power*Search’s website search features include a filter-based navigation on your search results page. Price, brand, and category filters are built automatically. Create an unlimited amount of custom filters. Power*Search is a Stand Alone Solution that Works With Any Type of Website. Enjoy the benefits of a fast, reliable search on any website. This is not a solution for ecommerce only. The SearchFit Ecommerce Platform is not required. Includes generic search capabilities to support any type of searchable content. Power*Search will work with your website. You can configure Power*Search to automatically import your search data from any server on a regular basis. Integrate PowerSearch With The Top SEO Shopping Cart Available. For websites powered by the SearchFit Ecommerce Platform, your product feeds can be automatically created and delivered to Power*Search. 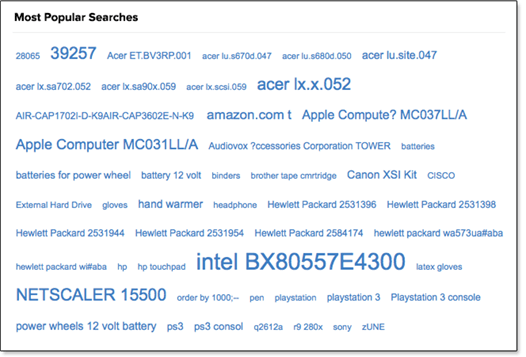 Other shopping carts, blogs and content management systems should have no trouble working with Power*Search. The SearchFit Ecommerce control panel includes a "Power*Search Settings" screen where you may integrate Power*Search with your online store. SearchFit Ecommerce automatically delivers a data feed to Power*Search each night after you publish changes to your site. SearchFit Ecommerce also delivers real-time order data to Power*Search so search conversions can be reported. View Real-Time Search Reports In Your Power*Search Control Panel. View Google Analytics Search Reports. Conversion Rate: Average Order Value and Dollars Per Visit of those who used your search vs. those who did not. 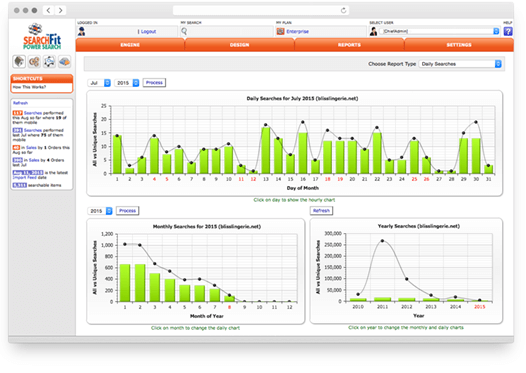 Usage: Includes chart of searches per data. Also shows table of transactions, Ecommerce Conversion Rate, Revenue, Average Vale and more. 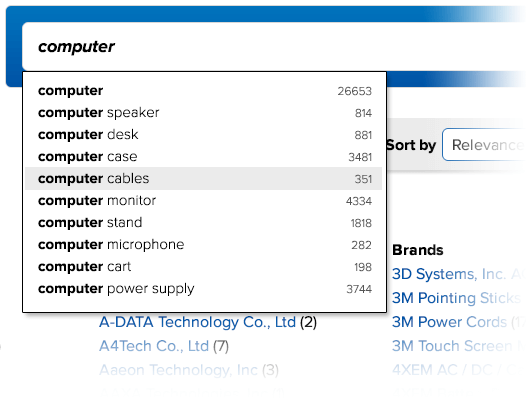 Search Terms: View a list of terms customers are searching for which you can analyze by dimension. Also shows a chart of search volume. Start Pages & Destination Pages: Tells you where customers performed the search and where they arrived after searching. Lets you add a second dimension like Total Searches, Conversion Rate, etc. Trending: Shows how many visits to your site included at least one search. Gives an idea of how frequently your search is used. Easily Setup and Maintain Your Power*Search with An Intuitive Control Panel. A simple, easy to use interface lets you setup and maintain your Power*Search. 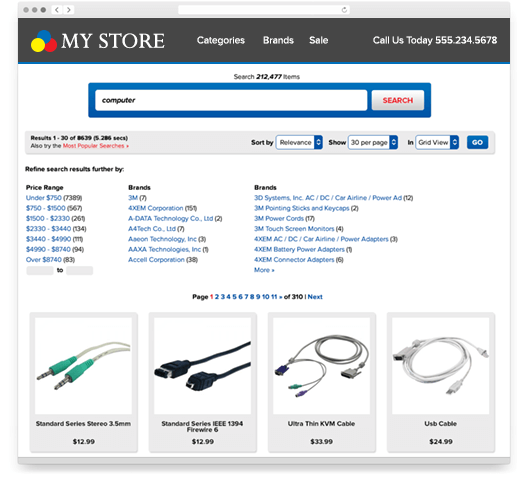 Power*Search uses the same powerful administration interface as SearchFit Ecommerce. You will be able to setup Power*Search with ease. Our development team can assist you with any difficulties you may have. Let Customers Search with Ease. Customers do not always remember the name of what they are searching for. Since you can’t be there to help, give them a tool that will jog their memory. Auto completion is a common user interface functionality on search forms. Once your customer starts typing in the search field, a drop-down appears showing search suggestions that are based upon what has been typed so far. As the user continues to type, the suggestions are refined. At any time, the user may click on a search suggestion and view the related results. Help Customers Find The Right Items. Customers should not have to pass a spelling quiz in order to find your items. When a word or phrase is misspelled, Power*Search may offer a suggestion for a closely matching item. Increases the chance that customers will perform a successful search. Additional Search Navigation Elements Are Available. Search Navigation refers to all the navigation elements on your search results page that the customer may use to conduct or refine his search. In addition to Filters and Auto Complete, you can provide visitors with some other helpful tools to help them find what they are looking for. Most Popular Searches: Let visitors see what others have been searching for. Visitors may click the Most Popular Searches button to view a tag cloud containing the most popular searches. The popular search terms are enlarged. Clicking on a search term displays the search results for the given term. Results Sorting: Users can sort results by a variety of criteria until they find the perfect match. Convert your existing website template into a Power*Search template. Based almost completely in HTML and CSS, the Power*Search Template System includes a Page Template, Search Result Templates and a CSS document. Just add a few Power*Search Keywords to your HTML code and your templates are ready. Separate Search Result templates are available for list and grid views. It is easy to customize the look and feel of your Power*Search page. Free Support Forum and Blog Articles. Get quick responses to your questions about Power*Search website search features and more from the Power*Search forum. The SearchFit development team maintains the forum and they, along with other forum members, will be happy to answer your questions about the setup and use of Power*Search. Find the latest Power*Search information and tips on the SearchFit Blog. Read articles about SearchFit Power*Search, SearchFit Ecommerce and add your comments.